Are you celebrating the turning of the seasons and welcoming cooler weather? We are loving this beautiful fall weather and gorgeous changing leaves. One way we are celebrating is to read books about scarecrows! 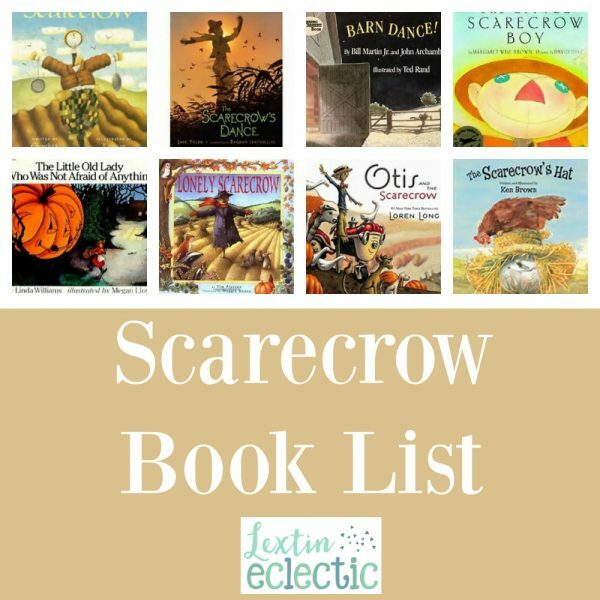 Here is a fun book list for autumn that is all about scarecrows! A resourceful chicken seeks the help of her farm animal friends to solve a problem, while giving something of herself along the way. This treasured picture book tells the tale of a little scarecrow boy and the lessons he learns from his scarecrow father about the world—until he decides to test his knowledge and himself. Scarecrows. They perch high above gardens and fields, with borrowed coats and button eyes and pie-pan hands that glint in the sun. But what else is there to know about them? It sure is dull staring at endless fields of corn all day, but it’s worse if you’re a scarecrow! Fuzzy Fred might be scary on the outside, but all he really wants is a friend. Jane Yolen introduces us to the fickle scarecrow, who decides to leave his station and dance away the fall night. After nightfall, Scarecrow and friends have a playtime adventure! Scarecrow plays by the light of the moon. In an old farmhouse, bathed in the light of a full moon, a young boy creeps to his bedroom window and looks outside. Was that a voice he just heard, or the hooting of an owl? On the farm where Otis the tractor lives, the farmer has introduced someone new—a scarecrow to shoo away the pesky crows. But when Otis and the animals greet the scarecrow with friendly smiles, the scarecrow’s frown never leaves his face. A lonely scarecrow, ignored and feared by everyone because of his flapping coat and jagged metal mouth, is covered by a thick blanket of snow. Before long, he is transformed into a jolly snowman. Once upon a time, there was a little old lady who was not afraid of anything! But one autumn night, while walking in the woods, the little old lady heard…clomp, clomp, shake, shake, clap, clap. The Scared Scarecrow can only stand still on his perch. He finds Scarecrow School so hard, especially after being bullied. Will he find courage? Meet one scarecrow who’s scared of everything in this uplifting picture book about fear and friendship.